3) give students an opportunity to explore their academic and career interests through the Naviance program, provided through the generosity of the PUSD Education Foundation. If you would like additional specifics, please refer to the Q&A below. Q: What will my child learn in the Freshman Academy course? We are especially pleased that Freshman Academy will include include significant use of Naviance, a multi-faceted, computer-based program to assist students and their parents with academic planning, interpersonal skill development, and career path planning. The funding for Naviance is generously provided by the PUSD Education Foundation. 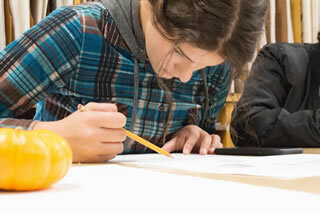 Skills that students will practice in this course are those that teachers and parents frequently tell us they “wish all 9th graders knew.” In addition, Freshman Academy will provide a thorough introduction to programs we offer at PHS that can place students on their pathway to success. Q: Will 9th graders be able to take other full-year electives in addition to Freshman Academy? A: YES! Every freshman has room in his/her schedule for at least two full-year elective courses. The Freshman Academy/Exploratory combo will be one of these courses. In addition, all students will choose at least one more full-year elective course. If a student wishes to take even more electives as a freshman, there are lots of options for this: The student may enroll in an early bird class, take our JROTC Freshman Academy option (details below), or visit with an academic advisor about other options. Q: Will this course be a requirement for graduation from PUSD? A: No. We have students transfer to PHS as grade 10, 11, or 12 students all the time. These students will not take Freshman Academy. They will be introduced to some facets of Naviance in other ways. Q: Can a grade 9 student be exempted from automatic enrollment in Freshman Academy? A: If a student can show a need for additional elective options in their grade 9 schedule, and none of the options above will work for a student, parents may request, in writing (email), an exemption from the Freshman Academy course. Given the many elective scheduling options available and the many benefits of Freshman Academy, we anticipate that nearly every grade 9 student will take Freshman Academy. Q: Do other schools have a course like this for freshmen? A: Yes, both Bradshaw Mountain and Chino Valley HS have courses that parallel this, as do many other high schools throughout Arizona and the United States. We are pleased to now be able to offer this opportunity to our PHS students. Q: Will my student receive credit toward graduation for Freshman Academy and their one-semester Exploratory Elective? A: Yes. Passing both one-semester classes will earn 1 of the 6 elective credits required for PHS graduation. Q: My child has heard great things about the PHS JROTC program. Can he or she take JROTC as well as Freshman Academy during their 9th grade year? YES! Students interested in participating in our award-winning U.S. Air Force Junior Reserve Officers Training Corps program as a 9th grader enroll in our JROTC P.E. class. This course includes many elements of regular P.E., plus leadership skills and a great introduction to JROTC. Starting in the fall, ALL elements of the Freshman Academy curriculum will be included in the JROTC P.E. class. So, students who complete the year-long JROTC Freshman Academy P.E. will earn BOTH their P.E. credit AND fulfill their Freshman Academy requirement in one class. This will free up one period each day for additional electives a student would like to take. Q: Can a grade 10, 11, or 12 student who missed the opportunity earlier enroll in a Freshman Academy course? A: If enrollment space is available in our Freshman Academy courses, older students may be placed in Freshman Academy. This is done by parent request, through sending an email to your child’s academic advisor for approval. Parents: If your student will not be at school, please contact our attendance clerk at (928) 445-0900, or by email debbie.fox@prescottschools.com.